Smallish bowls for serving, one per person. Breakfast cereal sized bowls are good. If you got the hunk of steak meat, put it in the freezer until it's half-frozen and stiff. This makes it easier to slice. Cut the outer fat off and reserve. Slice the rest against the grain into thin slices. Arrange neatly on a plate. Set out the burner, the pan, the bowls and utensils We're ready to go now! Heat up the pan on the burner, with the reserved piece or pieces of beef fat. Rub the fat around the pan a bit until it's melting. Once there's a good film of melted fat all around the pan, pour in the sugar and mix around a bit. Then add the liquid ingredients. If the pan is hot enough it should boil up almost immediately. 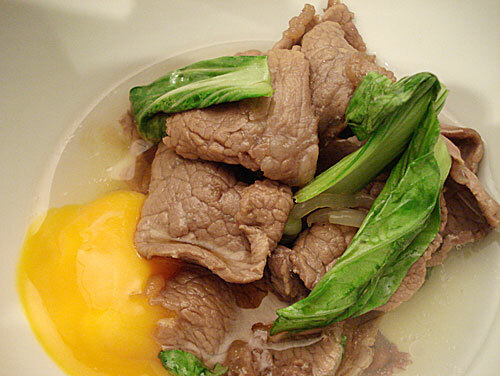 These first beef slices plus the beef fat provide the base flavor for sukiyaki, together with the warishita ingredients. Once the beef is cooking, you can start adding the other ingredients. 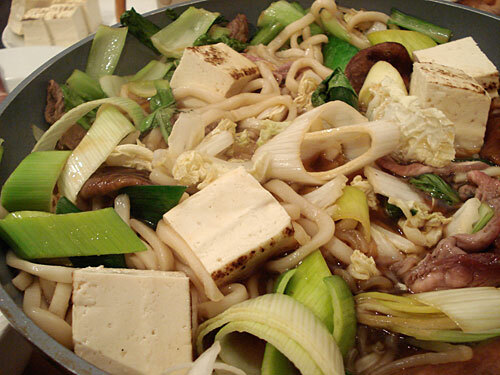 Start with the vegetables and shiitake mushrooms, then add the tofu and shirataki. Remember to scoop out the beef slices and eat them! Keep eating the vegetables and things as they cook. About halfway through, add the udon (if you add it earlier it can get a bit overcooked, though it will still be very tasty). Now, this is optional, but the standard dipping sauce for sukiyaki is a raw beaten egg. But only do this if you are sure of the quality of your eggs - they should be farm fresh, maybe date-stamped, or pasteurized. Keep on taking out cooked stuff and putting more stuff in to cook. 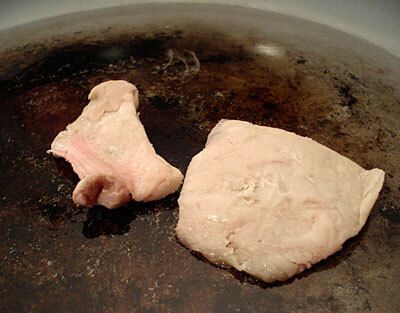 If the pan gets too dry, just add a bit of water and maybe a bit more soy sauce. Near the end of the proceedings, this is how the pan looks - everything a mellow light brown, having slurped up the goodness of that sauce. With Kansai style, you pan fry all the meat before adding everything else. 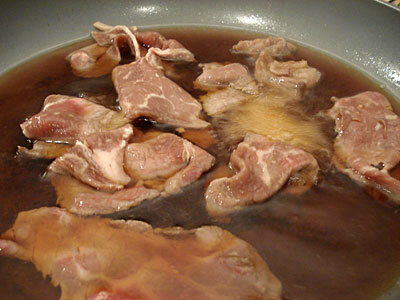 Melt the beef fat in the pan as per the Kanto style, then add the meat slices. Add the sugar to the pan and let it coat the meat. Then add the warishita, and proceed as for the Kanto style. I prefer the Kanto style because I think the meat can get a bit tough with Kansai style - and besides, that's the method I grew up with. In Kansai style, you often add fu to the pan (reconstitute the fu in water first, squeeze out well, and add to the sukiyaki pot). Kyu Sakamoto, known affectionately as Kyu-chan, was very popular throughout his lifetime in Japan as an all around entertainer. I was too young to know him during his singing heyday in the '60s, and when I did become cognizant of him I rather disliked him because he was known as a do-gooder and self-promoter (he did a lot of charity work and such, much of it well publicized, which was not really that common for Japanese celebrities). Besides, his singing was considered awfully old fashioned by us kids. I think he was so popular, especially in the 1960s, because the combination of youthful bravado and cheerfulness tinged with a sadness, even tragedy that he was able to convey, perfectly fit the mood of the times, when Japan was growing as a nation at an alarming pace while experiencing the side effects of such growth such as environmental disasters, stress and alienation. I'm not sure if he'd still be a hit in today's more cynical Japan though. Submitted by maki on 2009-01-13 19:36. Sukiyaki has become my mom's traditional meal for New Year's, in addition to osechi. She makes it Kanto style, except without coating the pan with fat (she uses vegetable oil, presumably for health reasons), and with only shirataki noodles. They get their meat from Mitsuwa, which for them is a 2+ hour drive. But good meat makes all the difference. I need a proper tabletop cooker to try making nabe (my mom actually uses an electric skillet), but boy, it's the perfect thing to have right now! Sukiyaki is so good. I´ve made my mother send me an electric pan just because I was so needing to make sukiyaki too but couldn´t find a perfect combination "pan-frying pan-tabletop cooker". A pitty I don´t make it so often , once beef can be very expensive here :(. Oh and it was lovely you mentioned Ue o muite arukou song.. I always believed Sakamoto being the "young melancholic-almost grunge :)" guy of that time . I like the song a lot (tnx to dad..) , but I don´t really appreciate that it is known as "Sukiyaki song" all around the world.. oh well..
Maki, I have such wonderful memories of when I was growing up here in Los Angeles in the 1960's. Yup. My Dad used to go to the local little Japanese market. We had a large Japanese-American population here. Even more-so now. It's fantastic! Anyway, Sukiyaki was such an amazing treat for us as well as learning how to cook at a little table-top burner. But when I learned about the addition of shungiku I was thrilled! To me that is still a MUST in most of my Nabes. I also especially remember the amazing flavor of the cooked beef being dipped into the raw egg. Mitsuwa has great Sukiyaki beef. Also, you have to use the beef fat when first cooking. Kyu Sakamoto's "Sukiyaki Song" was always a favorite of mine. Maybe because in the early 60's he represented the Japanese spirit to us here. I was in Japan when his plane went down. It was a true loss for those who I was working with. They were very sentimental about it. I'm not sure that the music that I still love from the 60's or 70's would be a hit with today's' youth either, but I'm getting out my Sukiyaki-Nabe, cracking open a bottle of good sake, and raising a toast to Kyu Sakamoto. Thank you Maki! This was my Dad's favorite party dish and I haven't had it since he passed several years ago. Have to bring out the cast iron pan to make some later this week. We used to make it on a keawe hibachi, indoors but since that's not PC anymore, I guess I'll use my portable propane stove. We used to call a hibachi hichirin then. Anyone know if there's a difference? I have to look this up but I believe that the song is dedicated to a female actress who also died young. The reference to looking to the sky to hide the tears is due to mourning this actress. I guess that hichirin = shichirin (七輪)? A hibachi is one kind of charcoal heater/cooking heat source, and a shichirin is another, so I am guessing that your propane stove was called a hibachi (s)hichirin to convey the idea that it was a replacement for both? Just guessing here! I was just back in Japan over the new year and of course one of top dishes on my list that had to be eaten was sukiyaki(not kanto style though). I live in Michigan near Detroit so getting the thinly sliced high quality beef is just not possible around here. The few Japanese grocers only sell frozen thinly sliced beef and that is just not acceptable. I actually never knew about the kanto style method of making sukiyaki until about a week and a half ago when I was watching a "food around Japan" program. Interestingly though they talked about making sukiyaki with miso(as opposed to soy sauce) in Yokohama as, according to the program, that is how it was first eaten. The people who tasted it raved about how delicious it was (of course that is what they always do) but to me it didn't look too appetizing. I was wondering if you had ever heard of this or if you have ever eaten it? In the '60's when I was in my own early 20's in northern California, almost everyone had a little hibachi, bought at Cost Plus and used outside on a deck or porch -- or taken to the beach. Heavy cast iron with wooden handles and a cooking grate that folded. Used charcoal briquets and was practically indestructible. Now it would be a small Weber "Smoky Joe" grill -- or a larger one. The only time I had sukiyaki was at the lovely and so exotic Sakura Gardens in Mountain View (now closed), cooked at the table by a waiter or waitress. You could sit at a regular table or on the floor in another room. It was expensive and so a special treat to go there. Your entry today brought back a flood of good memories -- including the song. Thank you very much, Maki. I love sukiyaki! Use to make it in Kyoto with a bunch of Aikido club members over for dinner. 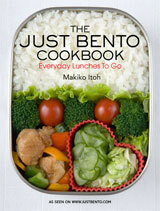 Love the social aspect of this dish and several others in Japanese cuisine. Thanks for the YouTube videos. I do recognize the first song, like a blast from the past. I was born in 61 so would have still heard that song around when I was a kid. Yum, it looks delicious! I actually haven't eaten sukiyaki at all before, though it's so highly recommended. Would a regular nabe pot work OK for this? I'm not too sure what a regular nabe pot is. Do you mean a donabe (a ceramic pot)? If so, that wouldn't be too good for sukiyaki, since that kind of pot is meant for simmered food. A skillet or something with a wide,flat bottom would be better. I've been wanting to ask about the donabe pot. Can it be used on a tabletop gas cooker for nabe? Or is it for hotpot that you cook on regular stove and then pour into it? Since you said it's meant for simmered food, it sounds like I cannot use it on tabletop cooker. You can use a donabe for things like the torinabe; it's also good for nabe that is cooked on the stove but kept warm on the table - e.g. for oden. 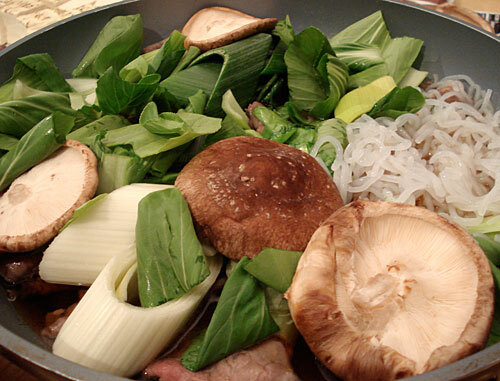 Sukiyaki is really meant to cook quite fast though, so that's why you need a wide-bottom shallow pot or pan. I did mean a donabe, yes. :) I'll see if I can find a skillet alternative then, thanks! I'm so glad you posted this as it clears up a mystery for me. I've heard of Sukiyaki growing up in California for years, but never had it until a few months ago at a usually very good sushi restaurant. It was on the menu and I figured I'd try it. Well it was just awful. They did not make it at the table, but I didn't know they were supposed to. It came in a wide pot and was mostly a lot of very, very sweet broth with some overcooked dry thin beef and soggy noodle. A few veggies swam in the broth too, but were also soggy and overcooked. I usually love all kinds of Japanese food, but just couldn't stomach this. Now I see it was not good sukiyaki, and looked nothing like your delicious looking pictures. I may try to make this at home someday. I guess it's just not a dish well suited to restaurant cooking. 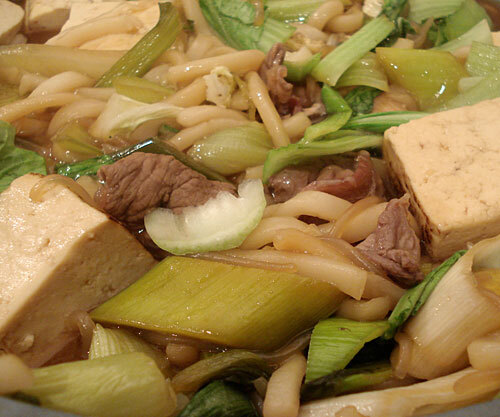 Indeed, sukiyaki is good because it's cooked at the table and you can scoop out the food as soon as it's cooked right. The delicate meat can get overcooked very easily! There is a teppenyaki restaurant near us and I noticed they had sukiyaki on the menu so we decided to try it last night. It was great - and only a little bit different from what you've described here. They pre-made the "sauce" and brought a big jug of it. Then they put fat in the hotpot and put onions in to fry before adding the sauce and then two slices of beef - so the beef was boiled but never fried. We had a plate with a few more slices of meat and a platter filled with vegetables. The waitress recommended we put the mushrooms in first and left us to it. We had a jug of water to top up the liquid but to be honest the pot was half full from the sauce - a lot more than it seemed like you describe here - and it was clearly not going to need more. We were wondering about the chopsticks though - is it ok to use your own chopsticks for this dish even though it's a communal pot? What type of dark soy sauce do you use? From what I know, there are 3 types of dark soy sauces, namely koikuchi, tamari and saishikomi. I normally have this at the restaurants and decided to give it a go at home. Unfortunately, I used light soy sauce and it ended up being overly salty. That's kind of how I stumbled upon this recipe as I was trying to figure out if I should use less light soy or just switch to dark soy. We use regular koikuchi soy sauce. 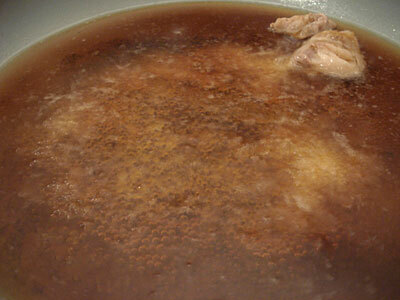 Usukuchi or light soy sauce is actually saltier than dark. I had a horrible restaurant experience with sukiyaki years ago. Now I know why. :) I made this tonight in my cheap rice cooker and it was delicious! I just kept it on "cook" with the lid off and it simmered perfectly. was a revival of a song from the 1930's &, in the 1963 version, was in both Japanese and English. Love sukiyaki! Will give this a try once I get all the ingredients! Dry sake is fine for cooking. No need to get anything expensive either. Just be aware that 'cooking sake' does contain salt, so you need to adjust recipes for that.